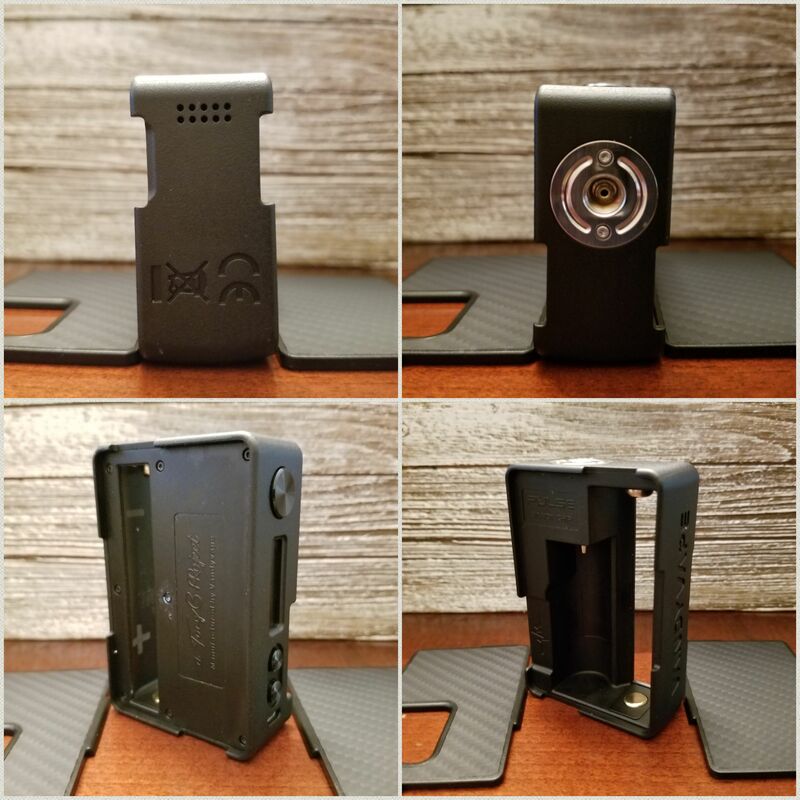 Thank you for taking the time to view my review of the Vandy Vape Pulse BF 80W squonk mod which was sent directly from Vandy Vape. 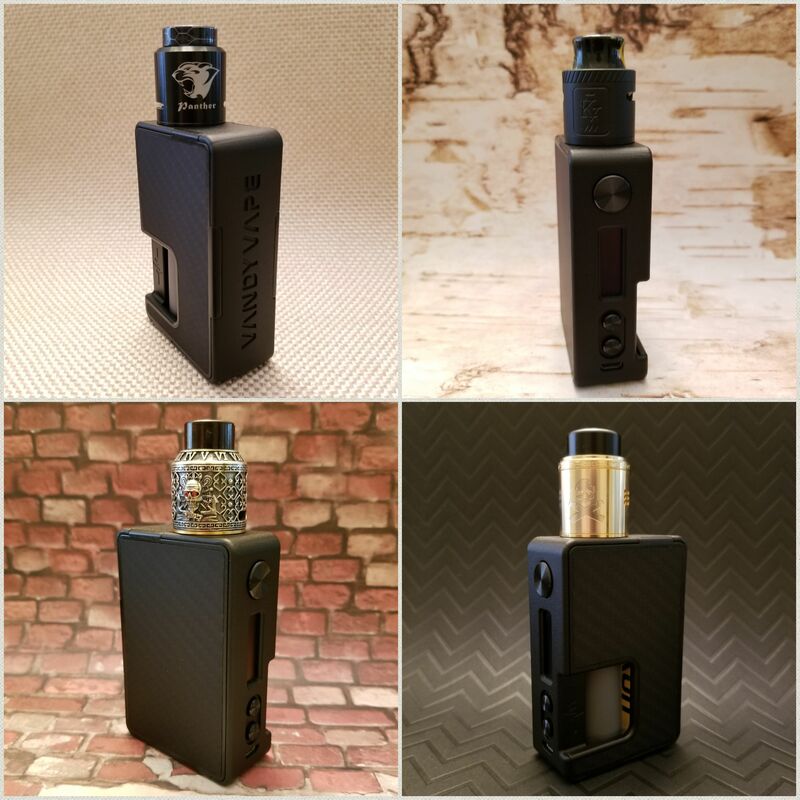 Having never owned the original and popular Pulse squonk box which was a mech I can’t really speak to the differences other than this one is regulated with a chip. I do know this is a little bigger but mostly the styling has remained the same. Designed in collaboration with the popular youtube reviewer Tony B this is sure to have a following. Only one color for the body, black, the only difference is the panels, I received the carbon fiber. You can purchase different color panels to match your style, nice touch there. Light weight considering it is not made of metal, plastic perhaps? It is durable and feels solid though and the slightly rounded back does give it a comfortable grip in the hand. Both panels are removable easily with a notch at the bottom. Both panels fit really snug with no play in them and the magnets hold them firmly in place. 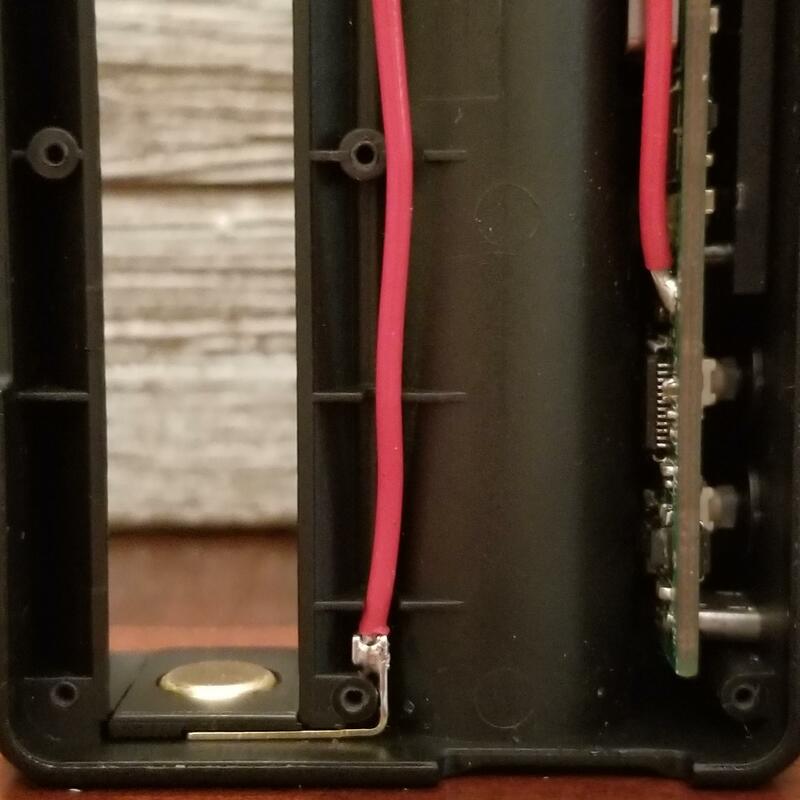 You will need to remove both panels to take the battery out, no battery ribbon installed. Vandy Vape lists the depth at 26mm, I measure a little more at 26.3mm but the sides begin to round out giving a flat platform of 24mm, 24.5mm tanks will overhang the bevel if that bothers anyone. Still looks good with a variety of squonk RDA’s I tested on it but most are 24mm anyway. Buttons are nice and clicky and the mod as a whole has no rattles, real solid build quality. The 510 is pretty stiff and not a lot of travel but not once did I have any connection problems. No leaking either while squonking. Only comes with (1) 8ml squonk bottle, actually 6.5 to 7ml as you have to account for the displacement the straw takes up. I was just shy of getting 8ml in the bottle using a syringe but that is to the very tip top and if you then screw back the straw the juice will go all over the place. Even with using a fill bottle from the 510 8ml won’t happen, the best possible scenario would be 7.5ml but not if your unscrewing the top cap and filling the bottle directly. Overall it is a solidly built squonk mod, not the fanciest you will find but you won’t regret the build quality. Note: Most of my testing was done with the original firmware V005, I did test out the new V006 which was released a few weeks after I received the Pulse but I will go into why I reverted back to V005 in the TC section. Not really much to complain about here, power performance seems solid even at 80 watts but it was a touch hotter when comparing to the SXmini G Class. They also include 5 memory modes which can be used to configure a curve in both power or TC. To select the memory modes press and hold the up/down button then select DIY. Once in DIY you can select the material used by clicking the power button 3 times. To adjust the DIY curve click the power button 4 times then set your watts for each setting up to 10 seconds. Overall it works good and is easy to set up. I prefered to keep it easy and just use power mode but you may enjoy it. They also include a Bypass mode, much like a mech as you will draw on the available voltage of the battery. A voltage mode is also included in case you like to adjust your vape that way. Tried both and they work fine, power mode is still my preference though. Firmware update V006 does add some nice features that are worthwhile for power mod users, if you don’t use TC it is a worthy update. With the original firmware V005 SS TC was adequate, maybe 5 to 10F hot in some cases where I had to turn down the temp to avoid dry hits. It could vary based on the build but for the most part it did OK and prevented dry hits while remaining smooth with no pulsing. Not a top performer of even in my 2nd tier of TC mods but I could get away with vaping in TC and not want to hurry back to power mode. Now this is where I ran into some interesting problems with the TC performance when updating to V006. Talk about an anemic vape, wow, what happened. Maybe they were going for the “No Dry Hits” at any temp technique, they won out there as I was able to max out the temp at 600F and got no dry hits. At my normal 430F the vape was hardly there, not even close to what it should be. I kept on upping the temp until I got at about 510 to 530F, somewhere in that range to get the vape I was accustomed too. I didn’t take any notes as I was on the road regretting not testing prior to leaving the house. When I got home I reverted back to V005 and it was all good again, well not good but OK. I tried V006 once more time later in my evaluation and the same thing, this time taking the temp up to 600F and no dry hits but what I was experiencing was not 600F as well. This was with my normal dual coil builds which I also verify with my SXmini G Class. 2 builds that actually worked OK were single coil builds, 1 a 26g spaced and the other a fused clapton spaced. While not great not the huge variation my dual coil builds showed which worked great on my G Class. If you are looking for a great TC mod the Pulse 80W is not it. With V005 it gives a decent TC vape though, you will just have to adjust your temp down to about 420 to 425 to avoid dry hits. Don’t even bother with V006, it is just all over the place and I will keep my Pulse running V005 from now on unless they issue a V007 that doesn’t mess up TC. 20700’s are better than 18650 as you usually get more amps and higher mah. It is not a tremendous amount though and I would not recommend 20700 as an upgrade for someone who is happy with there 18650 mods. I do prefer using the 20700 but the expense to upgrade is not as practical when 21700 mods are starting to emerge. 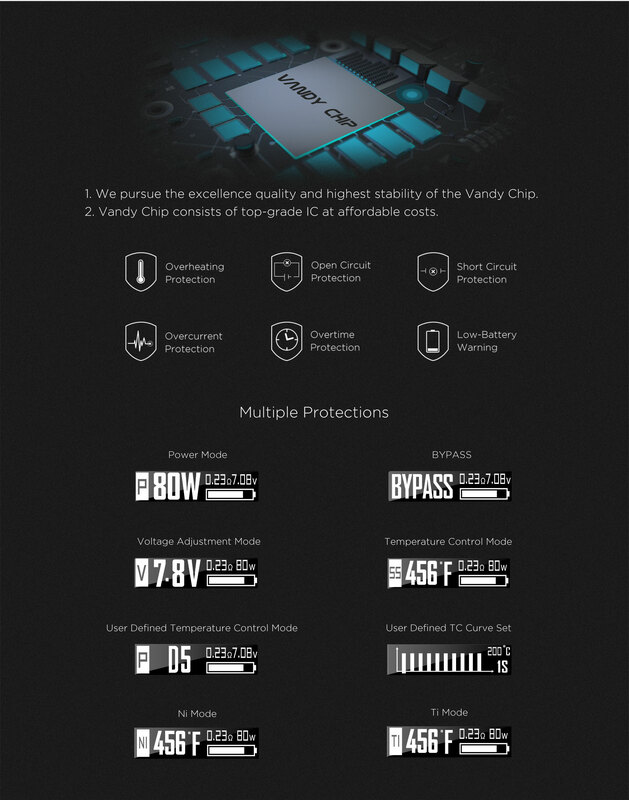 I do wish Vandy Vape would have went with a 21700 platform, that for me is a more significant upgrade over the 18650 than the 20700. I have been using and testing a lot of single 21700 mods lately and I have been impressed, I can get through a whole day at times if I am vaping conservatively. Can’t say the same thing about single 20700 mods though and the Pulse is no exception. For me single 20700 mods are 2 batteries a day, 3 if I am mimicking a locomotive. The Pulse is not bad as far as battery life but not good either. I found myself constantly picking it up and thinking damn, the battery is that low already. 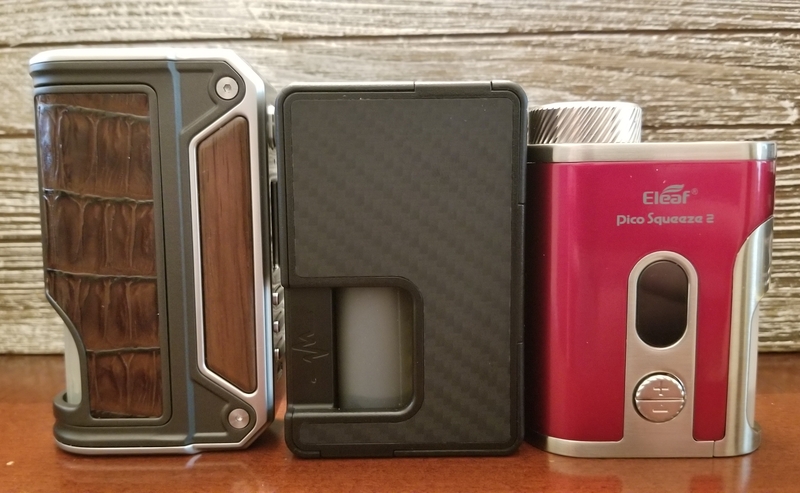 It is almost a deal breaker for me as I have other squonk mods that do not suffer the same fate. 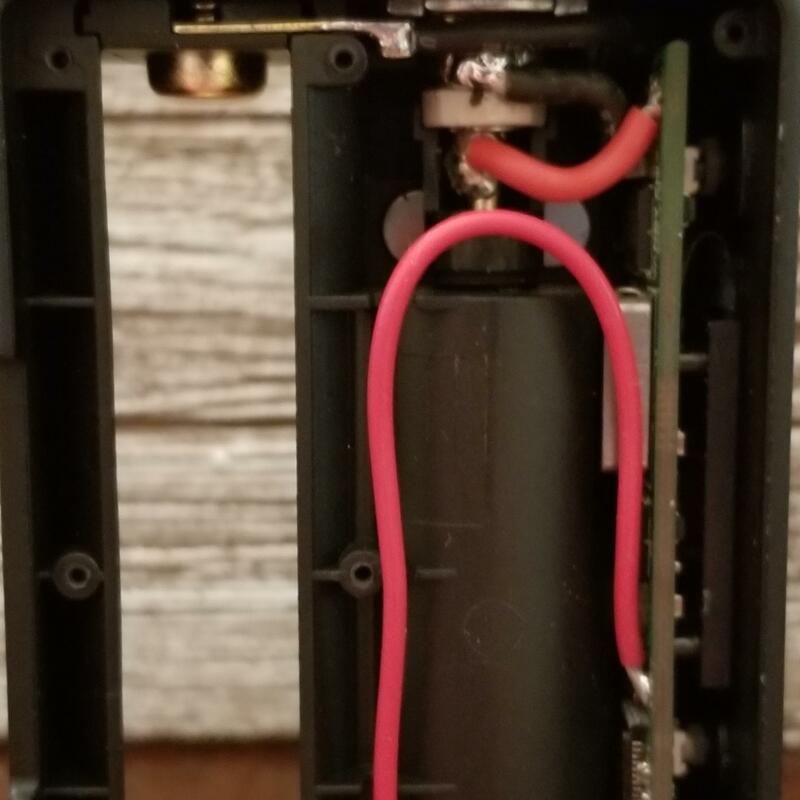 One thing to note as well if you have a Pulse 80W is be careful if you drop it, the spring on the negative side is really stiff and this is what happened to one of my 20700 when it fell off the kitchen counter about 4 feet. It doesn’t look that bad there but in person it is bad enough that I will recycle that 20700 rather than risk using it again. 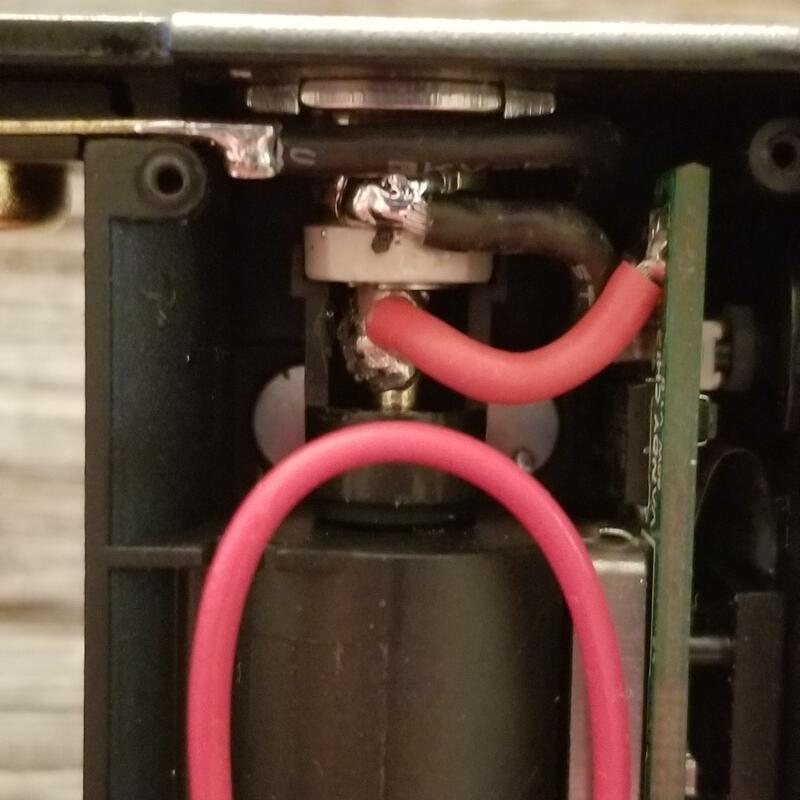 Not to blame Vandy Vape, hey, it was my fault for knocking the mod over but if it happens to you please immediately check the battery and dispose of it properly if it is damaged. I wasn’t able to remove the 510, was stuck and looked to require unsoldering which is not my thing. Looked to be a clean install though and good wire gauge on the 510. Would have liked a slightly higher gauge on the positive battery post but seems suitable. Is it a world beater at under $40? No but it is not meant to be a high end, ohhhh, look what I got mod. 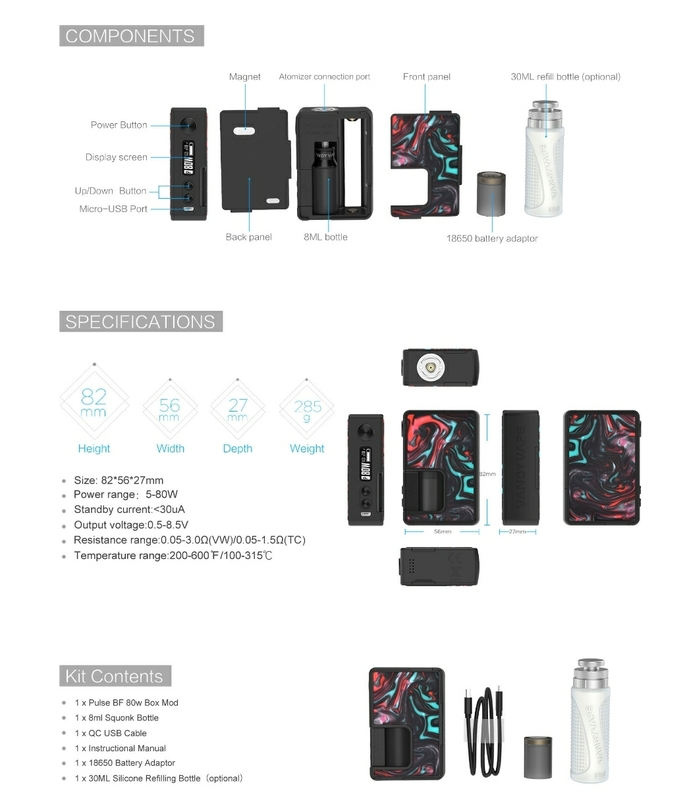 It succeeds in there stated goals and I would not have a problem recommending it to anyone unless they are a diehard TC vaper. 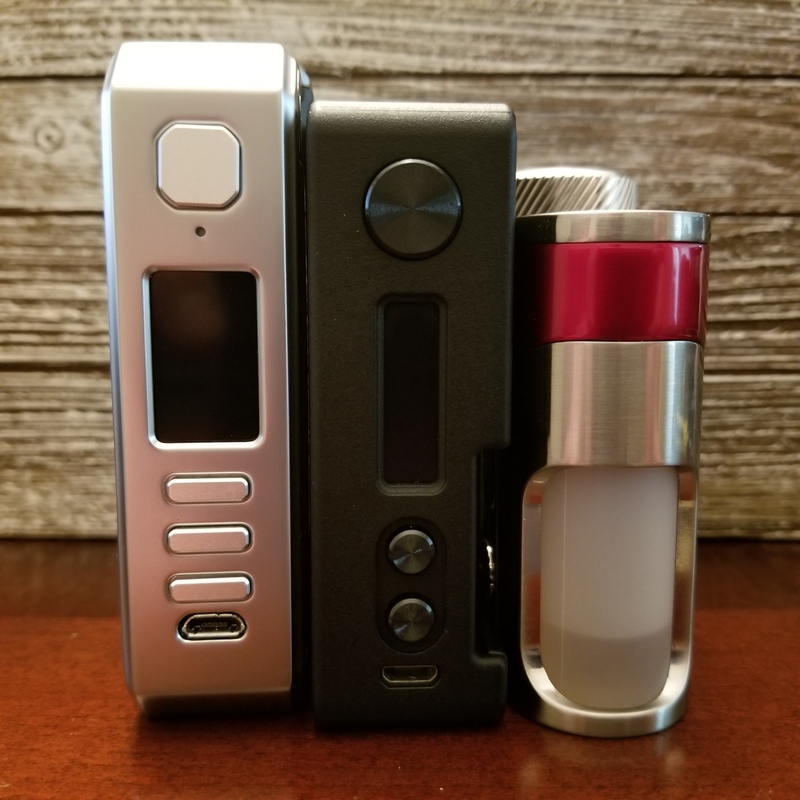 With that said the market for high performing TC squonk mods is very small and that usually comes with a much higher price tag. 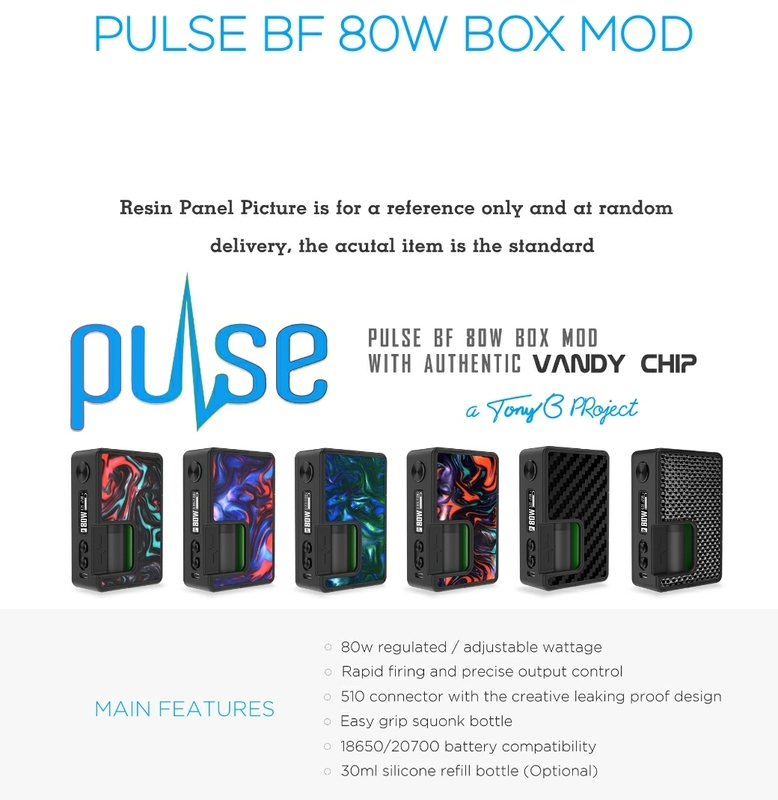 I want to thank Kary at www.vandyvape.com for sending me the Pulse BF 80w mod to review. You can find more info at the link below. Good review, thanks for the info. Glad the MOD survived and may your battery RIP. @mjag Nicely done, again. I appreciate your candor on the battery spring and the firmware “complications”. Very nice to hear everything up front. Yeah, too bad about the battery, not like I got a lot of 20700’s so that hurt but it had to be brought up so others can check if they drop the mod, safety first. The firmware update did delay my review as it just confused me as to why it would have gotten so much worse for TC when they were close with the original firmware. I did check a couple of reviews just now and noticed that yeah, others had the same problem. I agree, you wouldn’t expect something as important as TC to suffer from an “update”, but, you never know, and even more important that you caught it !!! No need to review the reviewer, when he’s doing his job. I think it was Evolv that did a survey and found that only about 10% of vapers use TC consistently. It is a niche segment for sure and why most companies can care less. It is even more confusing when a company will come out with a good performing TC mod and there next mod is horrible in TC, Laisimo and Sigelei are good examples of that. I guess it just shows how much they care about TC and sometimes they get lucky and even then don’t care as they don’t keep with what works. Oh well, at least they provide samples to test. The Nitecore Q4 works with 20700 and 21700 with no problem, there i8 though is a tight fit for 20700 and 21700 are hit or miss if they will get in there. The Xtar Over 4 Slim fits both easily and I believe there Rocket SV2 works as well but I don’t have that on hand at the moment. The Efest LUC Blu6 works with both as well. The Hohmtech Hohmbase will work with both but you have to move the positive side up to get it to make contact, A charger I love but would not recommend for 2X700 batteries.With all of these chargers the rest of the ecig batteries sizes are fine with the exception of 18350 which can be too short for some. 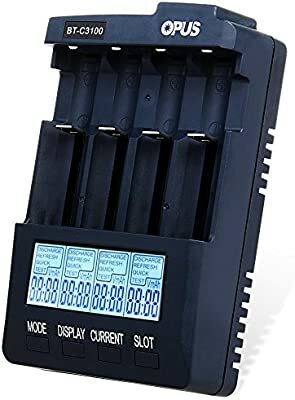 Edit: I am going to try and round up more chargers and write a review on what works with 2X700 batteries as many do not. Anyone have any suggestions on what chargers they would like included? 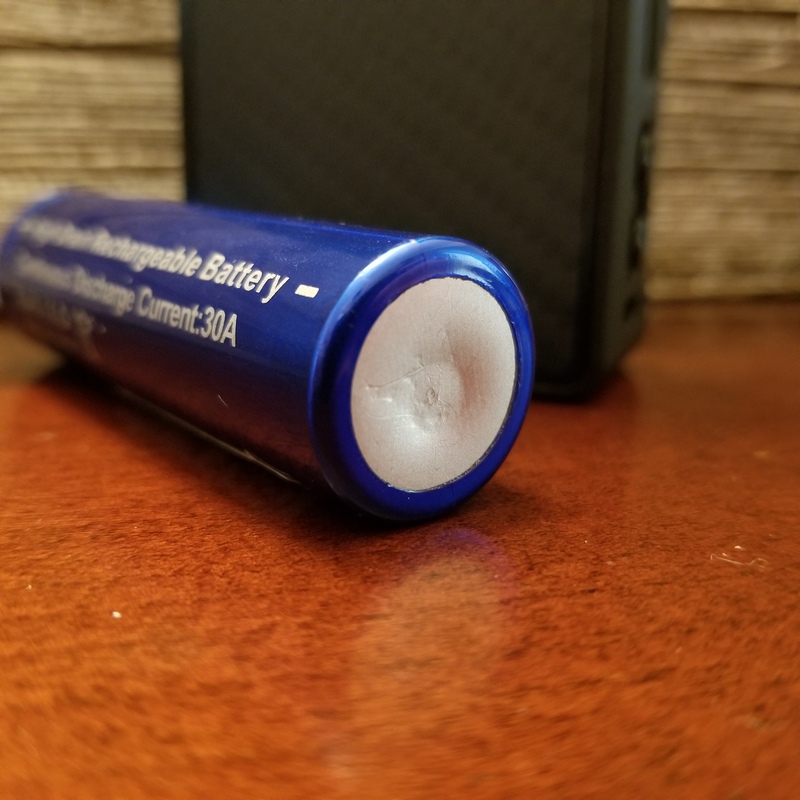 I use the efest blu6, for charging my 20700’s plenty of room, the efest luc4 is way too tight to use, although I don’t really recommend the Blu6 because you have to have the app on your phone to change the charge level, and it is a weak signal, if I go into the next room it won’t pick it up. I am sure there’s better options that would available but those are the two I have. On the Blu6 you can change the charge rate without the app, just press the button on the bay you want to change then the last button all the way to the left can be used to change the charge level. The also make a less expensive Efest LUC V6 which gets rid of the bluetooth function but I don’t have one so can’t confirm it will fit 2X700 batteries. Thanks for the info on that, I always just used the app to change it, leave it to me to not read directions. Thanks once more for a great review. I’m saving some money because of them! BTW, the Nitecore SC2 supports 21700 bats. I use one for my Lost Vape Mirage. @mjag I might fall into that group. I heard all the hype, read the posts, never really got into it. Have used it from time to time, and testing out the Replay on the 250C now, and although I like both concepts, if they both disappeared tomorrow I wouldn’t be devastated. I appreciate your perspective on it. Haha, your welcome, glad I could save you money! Thanks for adding to the battery charger question. I like that lost vape mirage too, cool mod. 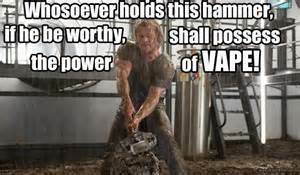 Yeah, I can totally see how it would not be of much interest to the majority of the vape community. For one thing TC can be finicky, so many factors that go into play for a great vape. Power mode is just more straight forward without all the hassle. If TC went away tomorrow I would still enjoy vaping in power mode, I just enjoy TC more. Thanks for your input my friend.